Just to be clear, this is not a sales or wants list. It's purely for your information, taken from the monthly newsletters issued by the UK company Collectors Club, between July 1976 (No.31) - when they started selling sound titles - and November 1979 (No.69). From June 1979 they were calling themselves Moviedrome (the name of their new shop), so perhaps the newsletter ceased in November? I can't remember, but if anyone has details of any later releases (perhaps from Movie Maker or similar ads), I'll be happy to add them. I have used their titles, whether that of the original film or not, but have added further details where given, or known by me. Month and year of each title's first appearance in the newsletter is given (sometimes this was merely within a cumulative listing with no fanfare!) The second date, following a "D", is that of the title's deletion announcement or final appearance in the newsletter - in some cases stocks continued to be available after the deletion was announced. By summer 1979, every newsletter warned about large numbers of unspecified titles due for deletion - probably linked to the rise of video which they also mentioned each month. It seemed like they were focusing more on their shop and (besides video) selling 8mm releases from other distributors. Many of the one-reelers, especially cartoons, are actually 120-160ft, but - in contrast to some other UK 8mm distributors! - Collectors Club were always very honest about this in their newsletter. They even specified the exact running times of their (often abridged) feature releases. It's possible that a few of the listed items, especially on the later newsletters, were actually other companies' product that CC were simply re-selling. (They certainly did this in the Moviedrome period, without necessarily specifying the source.) If anyone suspects this about particular titles, let me know and I'll add a note to the entry. The Man with the Golden Uke (George Formby clips) (6/79) Possibly Derann release re-sold by CC? Tumbleweeds (Wm. S. Hart, 1939 sound reissue) (8 reels, 78 mins.) (1/79) Without prologue, sold separately - see 1 REEL list. Wow did'nt realise they put out so many sound titles. I'll be on the look out for some of these. Jonathan you don'y happen to have a similar listing of their silent releases do you? I might attempt a silent list, especially the features and non-comedies. As they put out so many comedy shorts - the same titles often in different lengths, some only briefly available and others probably deleted before the newsletter started - I doubt it could be complete. I do have a "backnumbers" list from December 1976, but they started trading in March 1968 (mentioned in the March 1978 newsletter). Great list Jonothan, thanks for compiling it. Well done Jonathan a super job. 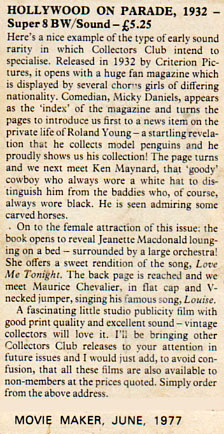 Here is one of the regular reviews of Collectors Club movies which is from 1977. The Hollywood on Parade series are amongst my favourites from them purely from a nostalgia point of view and they all make for super programme fillers particularly ‘Hall of Fame’ (Hollywood on Parade 1933 A-8) in which Bela Lugosi does his stuff with Betty Boop (Mae Questel) inside a Wax Works with some other great stars of the day. Thanks for everyone's comments and encouragement. It's the David Wolper TV series HOLLYWOOD AND THE STARS, made for United Artists who at that time owned the Warner Bros. back catalogue. Strange I should forget these as I bought most of those CC issued and even still own a couple! But there may have been others (31 episodes were televised according to http://www.imdb.com/title/tt0056765/ I know some of them had previously been released by UA as one reel silent abridgements. The CC releases were usually complete, supplied on 2 x 400ft reels but you could easily combine each one on a 600ft spool as the original programmes were about 26 minutes. An exception was the CC release of THE GREAT DIRECTORS on one 400ft spool, so presumably abridged. My copies always came in plain dark blue boxes without the usual CC logo and design, but they had the typical CC ink-stamp (or handwriting!) of the titles on the box edges, so I think CC did manufacture them, rather than supply them for another distributor. I don't know why they were limited editions - perhaps a copyright grey area due to the many clips from Warner Bros. classics? At the time, those clips were the main reason for buying them, but I now value the genre surveys most highly, for Joseph Cotten's slightly sardonic narration which poked gentle fun at the conventions of each genre, such as the flowery dialogue in swashbucklers or the relentless gunfire in gangster pictures, illustrated by inventive intercutting of various films. HOW TO SUCCEED AS A GANGSTER also contains some remarkable actuality footage, including close-ups of Dillinger's corpse on a mortuary slab! Good update to the list Jonathan. And one of the Collector's club titles to avoid at all costs is "Reaching For The Moon". Not only is the sound quality aweful but the picture is beyond dreadfull and totally washed out beyond belief. And if that were not bad enough, the picture itself is totally uninteresting, to say the very least! Possibly the worst motion picture ever produced!